Twelve (!) receivers on a single card, supporting any mix of cable (DVB-C, QAM-B/C) and terrestrial (DVB-T, DVB-T2, even ISDB-T) signals. All twelve transport streams are demodulated simultaneously, allowing you to monitor a complete network in real time. All modulation standards are included in the base product; no options need to be purchased. 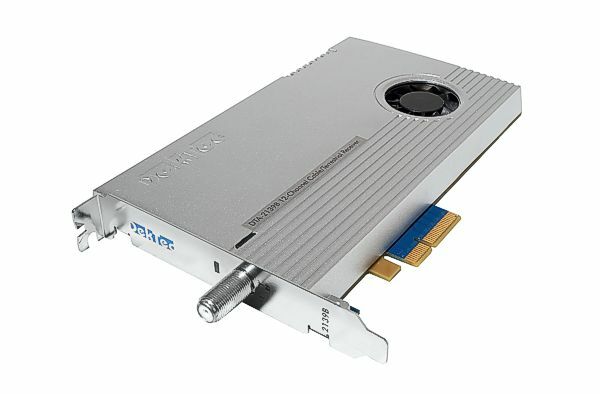 Twelve-channel cable/terrestrial receiver for PCIe with StreamXpert Lite software. Twelve-channel cable/terrestrial receiver for PCIe with VF-REC stream recorder and StreamXpert Lite software. Twelve-channel cable/terrestrial receiver for PCIe with StreamXpert 2.1 stream analyzer software. Twelve-channel cable/terrestrial receiver for PCIe with 48 Xpect points for full in-depth monitoring of all 12 channels. Next generation of the DTA-2139 with improved RF quality and support for terrestrial standards DVB-T, DVB-T2 and ISDB-T.
Twelve independently-tunable tuners and twelve demodulators, each outputting the full transport stream. Each receiver provides an indication of lock status, RF level and MER for that channel. 24/7 continuous compliancy monitoring of an entire cable or terrestrial network, using Xpect Mosaic or another monitoring solution. Receiving all (or many) services in a free-to-air terrestrial network and remultiplexing them to a cable network. Creating a mosaic of all services on a cable or terrestrial network. The RF input signal is amplified and split, feeding twelve receiver sections. Each receiver channel consists of a chip tuner, chip demodulator and an optimized DMA controller. The loop-through connector found on the DTA-2139 has been dropped, giving the DTA-2139B a slightly higher performance. Single-channel hardware-based receiver that uses the same tuner and demodulator chip as the DTA-2139B. Single-channel software-based receiver. Compared to the DTA-2139B, thanks to SDR technology, the DTA-2131 performs advanced RF measurements and supports more modulation standards like ATSC-3. 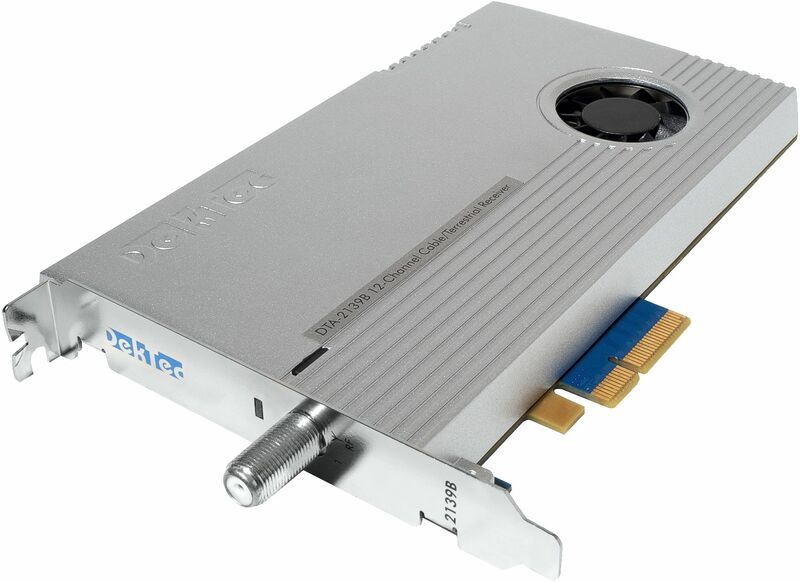 The "other side": DekTec's high-end modulator. With 8-channel firmware option, the DTA-2115B can modulate eight 8-MHz signals, which can all be demodulated by a single DTA-2139B, with 4 channels spare.